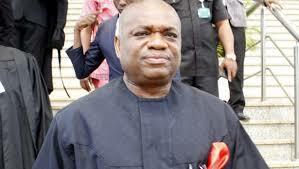 Former Governor of Abia State, Orji Uzor Kalu, on Tuesday said the leader of the Independent People of Biafra (IPOB), Nnamdi Kanu, is in London. He claimed that Kanu fled to the United Kingdom during the time the military were looking for him. Kalu disclosed this in an interview with newsmen after meeting former Military President, General Ibrahim Badamasi, IBB, in Minna. He said: “Nnamdi Kanu is where I told you he is, he is in London. He is safe”. Kalu explained that he visited IBB to canvass support for the re-election of President Muhammadu Buhari. Kalu explained that his campaign for President Buhari had nothing to do with the South-East getting the presidency in 2023 or his perceived presidential ambition. On the crises over the emergence of candidates at the forthcoming primary election nationwide, Kalu said conflict of interests were normal in politics. “The crisis is part of political development, if there is no crisis there will not be political development. Crisis is what makes political development there must be crisis and there must be solution”. The former Governor and his entourage arrived at Babangida’s Hilltop residence Tuesday afternoon in three black Toyota SUVs and two Hillux Vans. Kalu was ushered into the guest room, where he held a 2-hour closed-door meeting with IBB.